another chocolate & peanut butter recipe. sigh. i mean, are you really surprised? there’s enough chocolate and peanut butter going on around here to make a Reese’s jealous. i even add chocolate and peanut butter to my breakfast. (don’t judge). and most recently, i’ve been loading my favorite flavor combo into granola. 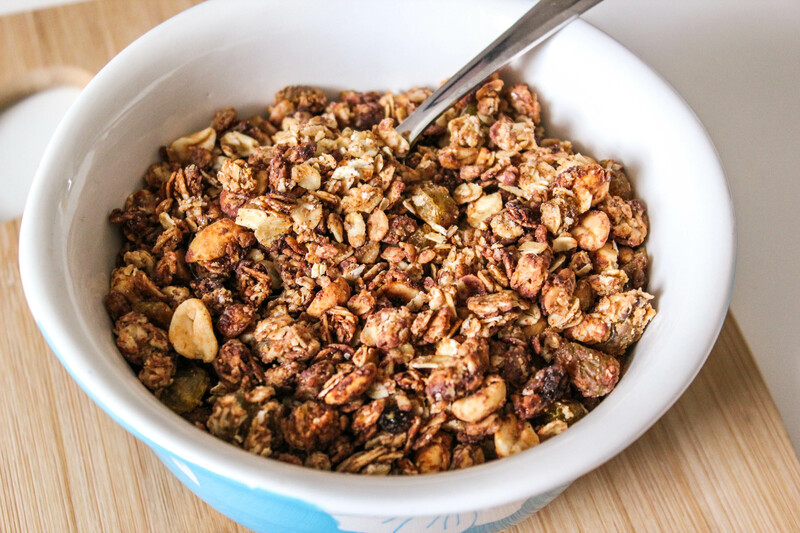 like i’ve mentioned before, whenever i’m making granola, i stick to 5 main ingredients and work off of those. i really just use anything i have in the pantry at the time in each of those categories. that’s the beauty of granola and/or granola bars… they are uniquely versatile and you can mix/match based on what you like/have in the pantry. if you like peanut butter and chocolate (who doesn’t?!?!?! ), then this is for you. it’s a peanut butter cup in a bowl. one of my many healthy, wholesome granolas that won’t weigh you down. enjoy! Preheat oven to 325 degrees. Line large baking sheet with wax paper. Set aside. In a large bowl, mix together oats, ground flax, peanuts, and cinnamon. Set aside. In a small bowl, melt peanut butter and honey for about 30 seconds in the microwave. You want it to be runny and mixed together well (add more honey or peanut butter if needed until smooth and liquidy). Pour melted peanut butter mixture over oat mixture. Make sure all oats are moistened. 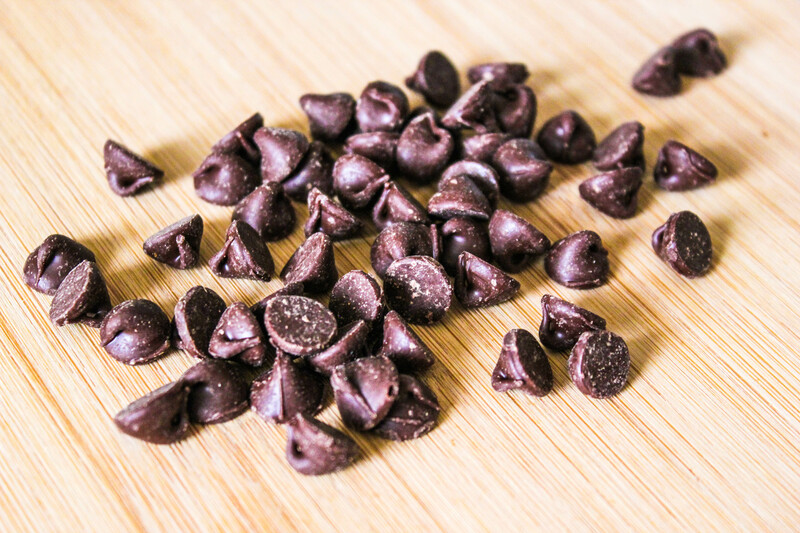 Lightly stir in half of the chocolate chips. Spread onto prepared baking sheet and press the oats down. Bake for 15 minutes, remove and mix around so that all sides bake evenly. Pop back into the oven for another 15 minutes. Remove and mix in the raisins and remaining chocolate chips. 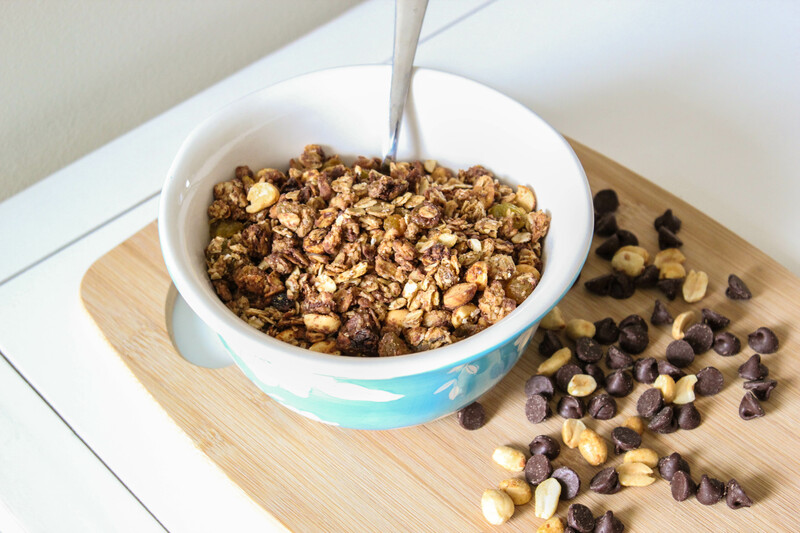 The warm granola will melt the chocolate and bind the granola. Store in an airtight container and enjoy! 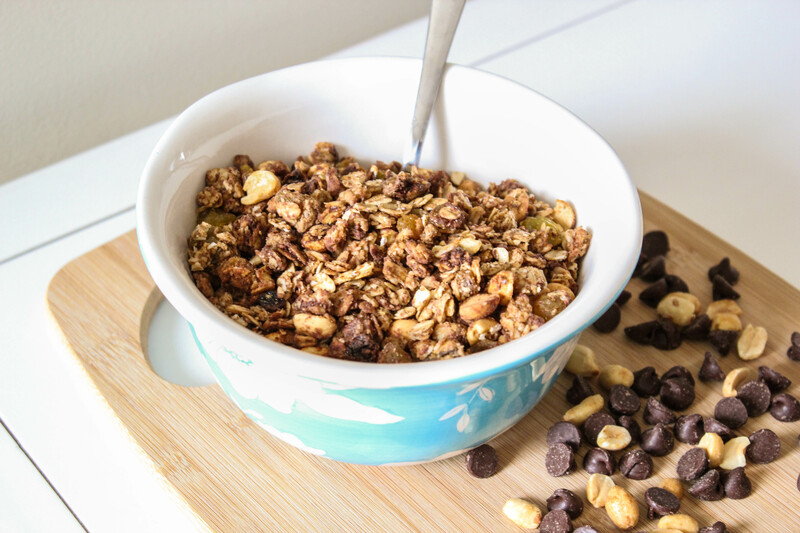 *this granola is pretty similiar to my oatmeal raisin cookie granola, but i added ground flax, honey roasted peanuts, more chocolate chips and used less cinnamon. « coconut toffee oatmeal cookies. can’t get enough of chocolate and peanut butter, yummmy! 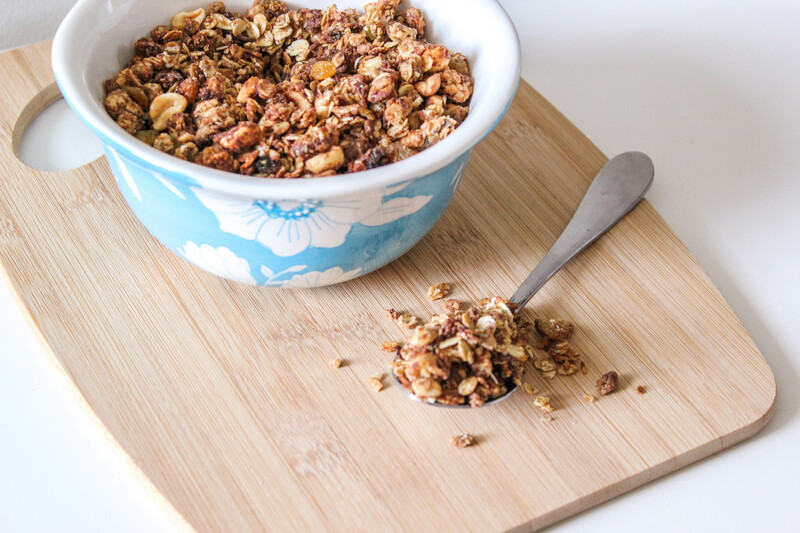 What a fun idea for homemade granola! It looks so delicious, Sally. Definitely something I could see myself munching on all day! Wonderful! I’ve never made anything using peanut butter and chocolate – I should! (Actually I have a few ideas), I’ve been planning to make my own granola soon! As a new subscriber who has recently found your blog, I think you have a great blog and therefore I’ve just awarded you and your fantastico blog with the Versatile Blogger Award. I think you might of made this just for me! LOVE. I can never get enough chocolate and peanut butter, so I say keep bringing it!!!! I mean really a reeses granola for breakfast? Awesome!!!! 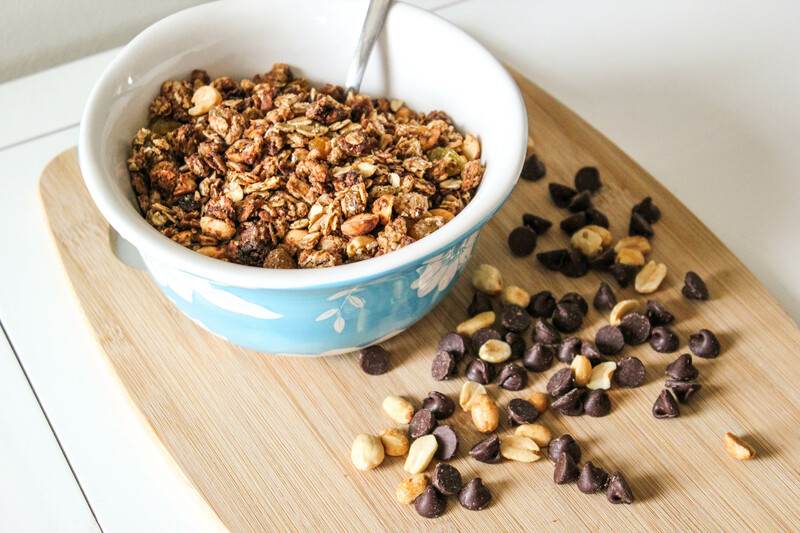 I have a bit of a granola obsession so I’m totally swooning over these right now!